Be the first to share your favorite memory, photo or story of Kathy. This memorial page is dedicated for family, friends and future generations to celebrate the life of their loved one. 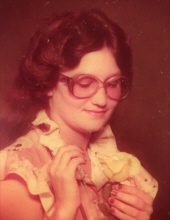 A memorial service for Kathy Tucker, age 57, of Caldwell, will be held at 11 A.M., Wednesday, August 1, 2018 at the Madisonville Funeral Home in Madisonville, Texas. Pastor John High will officiate the service. A brief visitation will be held Wednesday morning before the service from 9 A.M. to 11 A.M at the funeral home. Kathy Diane Tucker was born June 10, 1961 in Madisonville, Texas. She was a homemaker for most of her life and loved caring for her children, grandchildren and the children of others. Kathy also enjoyed sewing. She had lived in Caldwell for the past five years. Kathy passed away July 27, 2018 in Iola, Texas. She was preceded in death by her father; step-father, Arnold “Bubba” Roese and nephew, Shon Mosley. Surviving family members include mother, Norma Russell of Iola; husband, Wayne Kitkoski of Caldwell; sons, James Edward Tucker of Caldwell and Larry Wayne Tucker, Sr. of Caldwell; daughter, Norma Janell Tucker of Odessa; brother, Rusty Garner of Iola and sisters, Susan Mosley of Iola Donna Ray of Iola and Lisa Roese of Washington on the Brazos. Kathy is also survived by grandchildren, Alex, Raven, Autumn, Kenzee, Winry, Nolan, Jacob and Alyssa, as well as, numerous nieces and nephews. Madisonville Funeral Home in Madisonville, Texas is in charge of arrangements. To send flowers or a remembrance gift to the family of Kathy Diane Tucker, please visit our Tribute Store. "Email Address" would like to share the life celebration of Kathy Diane Tucker. Click on the "link" to go to share a favorite memory or leave a condolence message for the family.